This animated GIF is built using another graphic gift I made from a 1983 Montgomery Ward Catalog of the boy on a three wheeler. 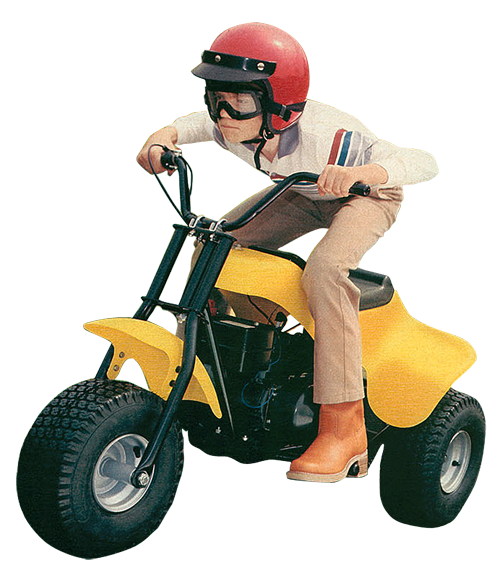 Once I cleaned up the PNG, I was trying to think of how I might race this three wheeler. But before I decided to run down Bambi, I first set out how to animate the wheels, as it would look silly if they stayed static. This GIF of a wheel was a good resource as it basically illustrated that some motion blur and a couple of different versions would likely do the trick. 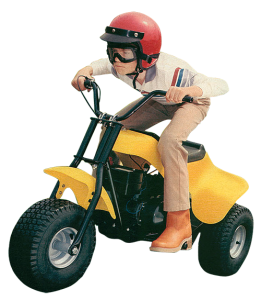 I think the front wheel did alright, but the back wheel looks a little static. 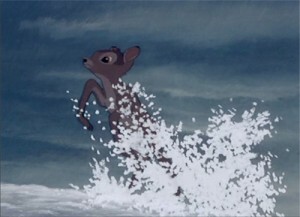 The funny thing was once I chose the clip from Bambi, I didn’t need to worry about the wheels anymore. They ended up getting covered by the snow. I love the old animation techniques where there are clear background, character, and foreground. Typically the background and foregrounds are static paintings and only the character is animated. But in the case of the snow scene there are these beautiful painterly splashes of snow in the foreground animated. Fortunately these splashes of snow were fairly easy to select with the magic wand. These became new foreground mattes over the three wheeler as it trucked across the frame. These mashups end up taking a lot longer than I expect, but I’ve really enjoyed pushing myself to get better and better with animation. Hope you dig it. This one turned out great! 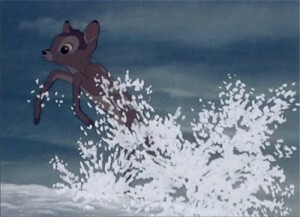 Poor Bambi! With his mom, he doesn’t have chance!